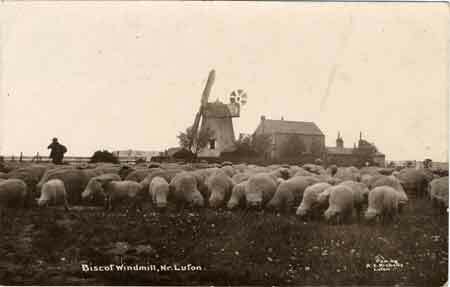 Friday 31st March 1916: The Bedfordshire County War Agricultural Committee has been informed that the Centre Labour Exchange Department of the Board of Trade intend to try to obtain Danish men to work on farms in England and Wales. The farms must be outside prohibited areas, engagements must not be for less than 12 months, and farmer will be expected to pay third class travelling expenses of the men from Denmark (on the understanding that this advance can then be deducted from the men’s wages). It is expected that the labourers will be mainly single men aged between 18 and 25, who have practical agricultural experience, especially in dairy farming, and who have taken a short course at a farm school. Farmers would be expected to ensure they were provided with reasonably comfortable lodgings and their pay would be at the current rate for skilled farm workers. Any farmers wishing to obtain Danish labour under these conditions is to apply before the end of March  to the Board of Agriculture and Fisheries. The letter was dated 28th March and published on 31st March, making this an impossibly tight deadline! Thursday 30th March 1916: Two Leighton Buzzard men have appeared in court charged with failing to present themselves to join the army as instructed. William Abraham, a 32 year old labourer, was supposed to have presented himself at Luton on 20th March. When arrested he claimed that as his railway voucher was dated the 18th he went on that date, but was told to go home until the 20th. As he did not have another railway voucher he did not return. When questioned in court he said he had been forced to borrow his fare back to Leighton Buzzard. The magistrates were told it was not permitted to give another ticket if a man made a mistake - the Chairman of the Bench pointed out that in this case the mistake had not been made by the recruit! As it was felt Mr. Anderson was not trying to avoid military service, he was simply to be handed over to the military authorities. Wednesday 29th March 1916: News is coming in of the damage caused by yesterday’s great storm. In the town centre of Bedford a gable end blew in over Messrs Golding and Company’s shop in the High Street. The Bull clock and the Town Clock were blocked up with snow and both stopped at quarter past three. At the Modern School a flagstaff was blown over, smashing one of the battlements of the turret, and in Midland Road a window, complete with its frame, was blown out of the Co-operative Society’s Hall. 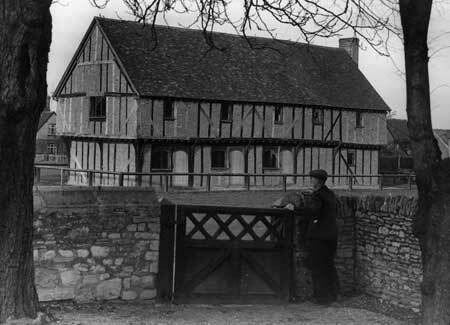 Along with the gale came flooding as Monday night’s snow melted; many houses were flooded out at Biddenham and at Goldington the green was largely underwater and a number of cottages were surrounded. Soldiers billeted in the Bedford area have begun clearing the many fallen trees from the roads and removing others which had been uprooted and toppled into the river at Bedford. In Newnham Lane no less than 39 large trees were blown down. The Town Council has permitted householders to fill their wood sheds by taking branches of no more than six inches diameter from the fallen trees, a task likely to take several days. In Kempston the famous walnut orchard of Mr. Walter Harter, J.P. has been wrecked by the great gale. Three hundred and sixty five trees had been planted in 1815 to commemorate the Battle of Waterloo. These had since been thinned, leaving about half the original number, and others have occasionally blown down; of the 160 remaining trees, only 40 survived yesterday’s storm. At Luton the roof blew off a stand at the football ground, with part being flung onto the Great Northern railway line behind where it hit a standing railway carriage. The Club secretary estimates that the damage will cost £150. Some of the huts at Biscot Camp suffered badly and the men were housed for the night at the Corn Exchange, St. Mary’s Hall and the Fire Station. Many trees were blown down in Wardown Park and elsewhere, and a number of motor cars had to be abandoned by their drivers. An employee at the Vauxhall Motors works in Kimpton Road was badly injured by a falling bough on Tuesday evening as she was entering the mess-room. During the initial snow fall on Monday evening a motor car collided with a footstone of the Market Cross at Leighton Buzzard due to snow obscuring the windscreen and covering the headlamps. On Tuesday afternoon farmer had great difficulty getting home from Leighton market, and a number of tradesmen were stranded during their delivery rounds. 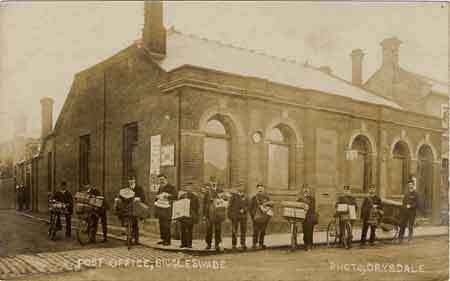 The Postmaster at Leighton reports that he has never seen or heard of such a “hopeless tangle of wires”, with all telegraphic communication interrupted and almost all telephone wires broken. Soulbury Road in Linslade was almost blocked by snow drifts three to four feet deep. At Husborne Crawley a large chimney stack was blown on to the roof of a public house where it crashed through the roof and through the bedroom floor into the room below; fortunately nobody was nearby and there were no injuries. Motor cars sent to meet the Duke of Bedford at Bletchley Station were unable to get there, and the Duke was forced to sleep on a couch at the Station Hotel, which was already full of stranded passengers. 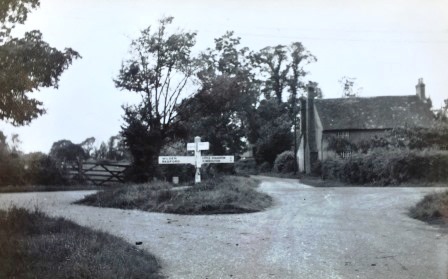 The next day he set out for Woburn in the hotel motor car but was stopped by fallen trees across the road; he then decided to walk to Woburn, leaving his valet and luggage to return to the station. Tuesday 28th March 1916: This afternoon Bedfordshire has been hit by the worst blizzard since the great snowstorms of 1881 and 1899. Train, telegraph, and telephone communications have been cut off, and substantial damage has been done by the gales which accompanied the blizzard. The snow began on Monday evening and continued overnight, but was slushy and was soon cleared by rain during Tuesday. The first indication that exceptional weather was on the way came when telegraph and telephone wires were down further north and southbound trains arrived several hours late – one train from Glasgow scheduled to arrive at Luton at 7 a.m. did not appear until 4 p.m. According to the driver: “I have never seen a blizzard like it in thirty years’ experience. I took over the train at Trent, and from there to Bedford the blizzard was at its worst – a fierce, blinding blizzard; nothing could stand against it. Telegraph poles were blown down in all directions. At one place I counted thirteen poles down in succession. In some places even the strong double poles had collapsed. In other places the wires broke with the weight of snow. Once we had to stop to get the engine clear of fallen wire. At Wigston we had to wait five hours. Telegraph poles had fallen on a goods train and blocked the line. The snow was about two feet deep there. When the line was cleared we went on again, but with the wires down the train at times had to crawl and stop to find out from signalmen what trains were on the line." The line from Northampton through Leighton Buzzard to Tring was also badly hit. A driver said “I went dead slow through all this mess, and it’s well I did so, for the frozen snow on the line was so hard that the engine bumped along just as though she might have been an old cart travelling along a badly cobbled road. From Northampton right as far as Tring we did the crawl act. Not a wire was standing. It was dangerous to look out, and me and my mate had to be pretty nippy when we did put our heads out in case the broken wires should tear our eyes out. We stopped at every signal box, and I got orders to carry on my train ‘on my own,’ to take no risks, and to feel my way every inch. With the wires down and a lot of the signal boxes out of gear it was a pretty anxious job, I can tell you. All along the home stretch platelayers were out working like slaves at clearing the line, and the last few hours of the journey seemed to me to be a ‘stop’ at every hundred yards or so.” The high wind caused drifting, and by 6.30pm the Luton-Dunstable-Leighton line was blocked, with a goods train and a passenger train both snowed in at Blow’s Downs; the passengers were obliged to walk the five miles back to Dunstable Church Street station through the snow. 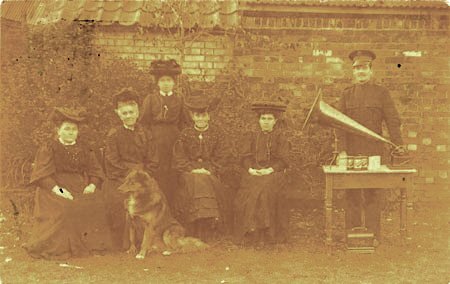 Monday 27th March 1916: Interesting news has been received of Petty Officer Albert G. Hartwell of 14, Maitland Street, Bedford, a former pupil at Ampthill Road School. He comes from a notable local aquatic family. His father was coach of Bedford Rowing Club for more than twenty years, his brothers won many prizes, and his sisters are also expert swimmers and rowers. Albert himself was cox of the Bedford Rowing Club and winner of three cups at a single Town Regatta. After leaving school he also gained flying experience, first with Mr. James Radley of Huntingdon (formerly of Bedford), and then under the tuition of Mr. Moorhouse and Mr. England, both men well known in the flying world. The King himself has written a message of appreciation to the Armoured Car Squadrons, and Her Highness Princess Marie Louise of Schleswig-Holstein has given a specially designed waistcoat to every officer and man. The Squadrons’ Commander, Oliver Locker-Lampson has written a gracious reply. 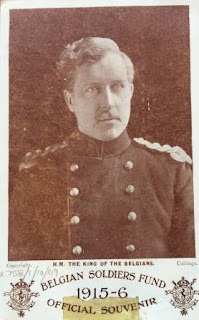 Despite his absence on active service Commander Locker-Lampson continues as Member of Parliament for the Ramsey Division in Huntingdonshire, where he was elected in 1910. Second Lieutenant Herbert Edwin Tasker, of the 6th Battalion, London Regiment (City of London Rifles), was killed on 22 August 1918, aged 24, while attached to the 19th Battalion. Saturday 25th March 1916: Yesterday evening Mr. J. Slack, of the Woburn Experimental Fruit Farm, gave a lecture about the rotation of crops to an interested audience at the Leighton Buzzard Institute. He explained that the secret of getting the most out of the land was "judicious manuring", and allowing plenty of space between rows. Planting early potatoes between rows of spring cabbage not only saves space but the sheltering cabbage protects the young potato plants from frost. Sowing a few peas in amongst the potatoes was also recommended, as the potato plants provide support for the peas and if sown together it is still possible to hoe between the rows. When questioned on the best method of planting potatoes, Mr. Slack said there was little to choose between planting when the ground was dug or leaving it until later. He did not recommend using a "dibber", except in very light soil, as it tended to harden the surrounding soil and made it hard for the roots of the potatoes to expand; it also allowed water to gather in the bottom of the hole and rot the tubers. The Act states, I believe, that leave of further appeal should only be granted where the case in question involves a principle which may be typical of numerous other cases. I feel that my own appeal is such a one. The Appeal Tribunal, as did the Local Tribunal, seemed quite convinced that mine was a genuine case of conscientious objection, and I claim that it is one of those termed “exceptional” in the instructions from the Local Government Board, and that I am therefore entitled to absolute exemption. Surely the fact that I refused what was to many the easy way out (of acceptance of work under civil authorities) is a further proof that mine is an exceptional case. However, I do not wish in any way to decry the decision of the Appeal Tribunal. Although I cannot accept it, I believe it to have been the honest opinion of the Tribunal. My sole object is to establish the fact that a genuine conscientious objector is entitled to absolute exemption if nothing else will meet his case. May I also take this opportunity of thanking the members of the Tribunal for the very considerate attention and hearing which they gave to the cases of conscientious objection. If you decide to grant me leave of further appeal, and a special form of application for such leave is necessary, I should be pleased if you would send me such a form by return of post, as I believe the time allowed is very limited. 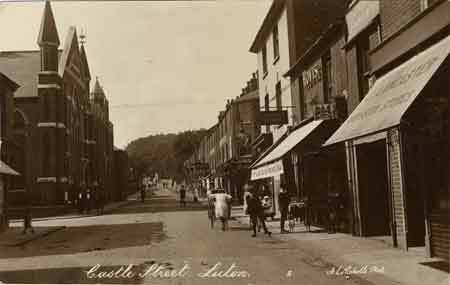 Thursday 23rd March 1916: A large audience of attested married men gathered at Castle Street Hall in Luton on Monday night to complain they had not had “fair play” in the way they were being treated in the government. They had been assured when they attested under Lord Derby’s scheme that they would not be obliged to serve until all the unmarried men had been called up. However, the delay between the completion of the recruiting scheme and the introduction of conscription had allowed large numbers of single men to go into reserved trades. As a result married men were being called up much sooner than expected. To add insult to injury, conscripts appeared to be receiving more favourable treatment than attested men. Mr. Hugh Cumberland who chaired the meeting declared “the whole thing had been a bungle from beginning to end, all because the Government had not faced the music, and the only fair way now was to have conscription for everybody. There were other reasons the Government’s pledge to send unmarried men first had not been carried out besides the delay in introducing the Military Service Bill. The number of conscientious objectors came as a surprise – one speaker said he had no idea there was so much conscience in the country and “the blasphemous, disgusting statements made by many of them made him sick”. A resolution was tabled which included a request that all notices calling up groups of married men be withdrawn until “all single men engaged since August 15th last in reserved occupations, and not actually indispensable, and those sheltering themselves under the plea of conscientious objection, are called up for service, or until a revision of the Military Service Act so as to include all men of military age”. It also requested “that adequate provision to meet domestic and business obligations of married men when called up, be made”. The resolution was carried enthusiastically and was to be sent to the Prime Minister, Lord Derby, and Luton M.P. Mr. Cecil Harmsworth. Yesterday evening another meeting was held at the Temperance Hall in Leighton Buzzard with over one hundred attested married men present despite bad weather. It was stressed that this was not a meeting of disloyalists, or a “stop the war” meeting. The men were asked to speak “as if a German spy were present, and to make no remark that would tend to please him. Two resolutions were passed. 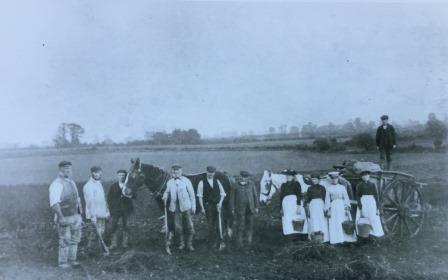 The first recorded the opinion of the attested married men of Leighton Buzzard, Linslade and district that “pledges which form an essential part of their attestation contract have not been and are not being kept” and demanded that “single men should be dug out of munition works and Government offices before any of the married groups are called up”. The second asked that any married man called up for the Army “should be freed from all anxiety as to the financial position of his dependents during his absence”. These resoltuions were also to be sent to the Prime Minister, Lord Derby, and the local Members of Parliament. The meeting closed with a vote of thanks to the Chairman and the singing of the National Anthem. 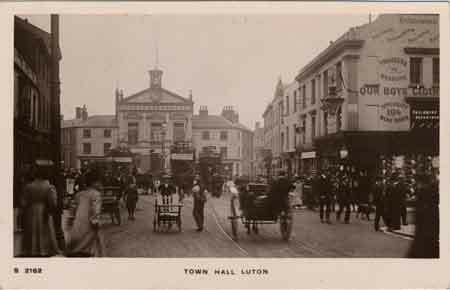 Wednesday 22nd March 1916: The Appeals Tribunal for Bedfordshire sat for the first time today at Luton Town Hall to hear appeals against the decisions taken by tribunals in respect of applications for exemption from military service. All the morning and part of the afternoon was devoted to hearing appeals by conscientious objectors. The Chairman stated that he was looking for evidence that an applicant’s conscientious objection was genuine and of long standing, and would attach weight to any evidence that the applicant belonged to a religious body with well-known views on this question, or to proof that his opinions had been openly expressed fro a considerable period of term. The first applicant, who appeared to have left the Church of England because he did not want to take on parish work and had a grievance against the vicar, was dismissed as a “bona-fide shirker”. The second case to be heard involved a member of the Society of Friends who had been ordered to undertake non-combatant service by the local tribunal, but who believed to play any part, even as a non-combatant, would be as bad as being a soldier and carrying a rifle. He refused to accept exemption on condition that he would accept employment in some work which the Tribunal considered of national importance and his application was refused. The longest case was an appeal by the military representative against the absolute exemption of an individual who described himself as an “ambassador of God”. It was alleged that the man’s conscientious objection was not proved, that he had equivocated in reply to questions, and that he had used his influence to prevent others engaging in military service. After discussing the case in private, the decision of the local tribunal was confirmed and the man exempted. One case was adjourned for a fortnight to give the applicant time to prove that he was to be engaged on work of national importance, such as for a railway or dock company. The majority of the remaining cases were also refused, including an appeal by a member of the International Bible Students’ Association who stated he was prepared to accept “the extreme penalty” for refusing to serve. All the conscientious objectors whose appeals were refused asked permission to appeal to the Central Appeals Tribunal. They were told this would only be possible if an important question of principle was raised, which in these cases it was not. Monday 20th March 1916: As the war has progressed women have entered many areas of employment for which before the war it was assumed they were not fitted. There are now women working on the railways, on the trams, in the postal service, carrying out bread and milk rounds, and employed in munitions factories. Despite these successes farmers continue to be prejudiced against the idea of employing women on the farm. 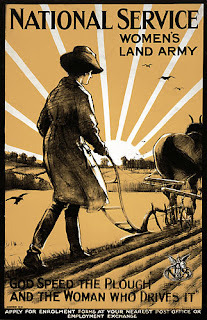 It is apparent from the number of appeals received by the rural tribunals from farmers seeking exemption for their workers that the only way to meet the demand for labour will be by employing more women. To achieve this, the Agricultural Education Committee of the County Council have introduced a scheme for the instruction and employment of women in light farm work. Each student will be sent to an approved farm for at least eight weeks. During the first four weeks she will be paid 10 shillings a week, subject to satisfactory service. During the second four weeks the farm will pay her 15 shillings a week. At the end of this training period the students will be free to make their own arrangements for the future. This scheme and its rates for pay will not apply to either hay-time or harvest, and hours of work must be approved by the Committee. Where possible, arrangements will be made for two or more women to work together on the same farm. "I am in the muddiest hole you could dream of - mud up to the knees, and now snow. Is there possibly some 'fairy godmother' in your district who would be kind enough to send me a waterproof? It is very necessary; we are exposed to all weathers. Please try to find me this 'rara avis'. I am of middle height. I don't ask for anything luxurious, but khaki coloured if possible." The day his appeal appeared, M. Pennartz was delighted to receive both a splendid waterproof, and a motor cyclist's rubber waterproof and overalls. He was able to send the second gift to another Belgian soldier, Michel Counet d'Aywaille. This young man, still only 19 years old, ran away from his home in February 1915 with eight others, intent on joining the army. As they crossed the Dutch frontier the group was fired on by a German patrol and four of them were killed. After reaching Holland, the survivors travelled on to England where they joined the Belgian army. "I cannot let pass this opportunity to acknowledge publicly in my name and those of my compatriots, our gratitude to you personally and to the generous givers. We Belgians, particularly those from Wallonie, knew nothing of, or rather did not understand Great Britain. Since the early days of my stay in England I have had reason to appreciate at its true worth the generosity of the British people, and especially of British ladies, - a generosity which is characterised by the sincerity, the discretion, and the great delicacy with which it is dispensed." Saturday 18th March 1916: A Salvation Army officer from Cheddington has appeared in court and pleaded guilty to allowing lights to shine from the windows of the Salvation Army Barracks at Eaton Bray on 4th March. Police Constable Storr noticed a bright light at 9.25 p.m., entered the building and found three lamps alight. Wesley Kitto expressed his regret at the offence, explaining that there had been boards against the windows, but that evening one had been removed to make an improvised table for a tea party. He was fined 10 shillings and 6 pence, including costs. Friday 17th March 1916: Concerts were given yesterday at the Bedford Corn Exchange by blind musicians on behalf of the National Institute for the Blind. The first performance was for civilians and a second performance took place in the evening for a military audience. Since the war began a number of blinded soldiers and sailors have been added to the Institute’s membership. Locally these include Mr. 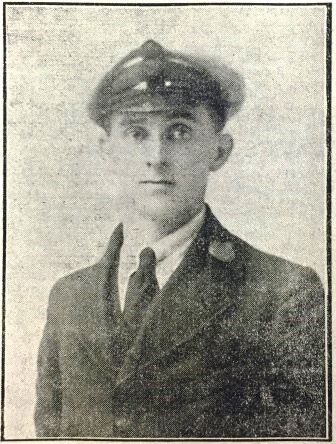 Guy Pym’s footman  who was blinded at Anzac, and Captain Owen, an Old Modernian and Bedford Rugby three-quarter. During the interval Captain Owen was led on to the platform by Mr. Machin and introduced as a “very gallant gentleman” who would tell them not “of sitting against a rock whilst lead was spattering all round him, so that he had 42 pieces of it in his body; but of the magnificent work being done by the Institute”. Captain Owen said he “was not such an old crock as Mr. Machin would make him out to be” and was feeling very fit. He told the audience about St. Dunstan’s , where he had spent six months. At the beginning of the war the president of the National Institute, Sir Arthur Pearson, had borrowed a house of that name in Regent’s Park, with beautiful grounds of 14 acres. Here soldiers and sailors who had been deprived of their sight were taken after their convalescence and trained for six months. Mr. Pearson and his Committee also supervised their after-care. Since the beginning of the war 281 soldiers and sailors had lost their sight, with some also losing limbs and speech. At St. Dunstan’s they were trained in a variety of trades, ranging from poultry keeping and market gardening to typewriting, ensuring that they would not be dependent on charity. The Institution cost £200 a week and depended entirely on donations. Charles Guy Pym was Conservative Member of Parliament for Bedford from 1895 to 1906 and High Sheriff of London in 1911. Thursday 16th March 1916: The tribunals which sat this week at both Bedford and Ampthill heard a number of applications from conscientious objectors. At Ampthill a provision merchant claimed exemption on dual grounds, both as a conscientious objector and as the sole support of his parents. 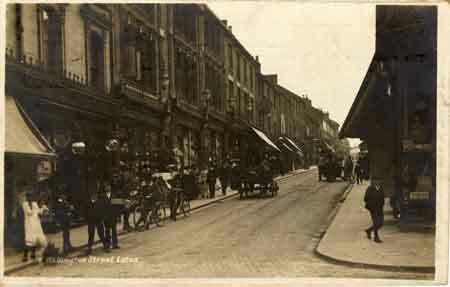 He also had a sister, who was due to be married at Easter, who looked after the business while he was out getting orders and carried on the drapery department. He also had a lad to help him. His conscience had troubled him from boyhood and he did not think killing was right, though he would be willing to go with the ambulance. He was a Wesleyan, not a Quaker. Another man applied for total objection as a believer in the sacredness of human life and the brotherhood of man. He would not send men abroad and would not have a Navy; he did not think men ought to go and fight. Both these applications were refused, as was that of another man who stated that if he had the option of killing or being killed he would be killed, and that if he had to go into the trenches he would rather go without a rifle than with one. 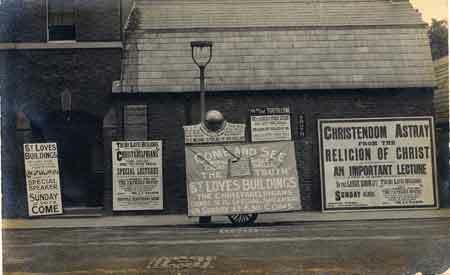 At Bedford a Christadelphian applied on grounds of conscientious objection. This man was an engineer engaged in shell manufacture. Although he would rather “suffer the extreme penalty” that affirm or swear to support any institution in the taking of human life, he was compelled to make whatever his employer undertook to manufacture. He was granted conditional exemption so long as he continued to be employed in munitions work. 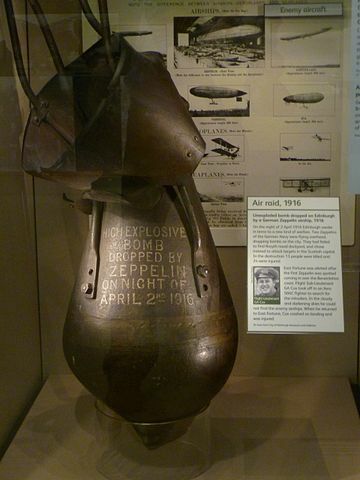 A 19 year old student at the Royal College of Science said he objected to taking part in the war, but recognised that he must make a concession and so would be willing to take part in work such as mine-sweeping which was destroying instruments of war. He stated “I cannot see any point in the war. It seems to me pure destruction for no end. I do not believe the ownership of land is of sufficient importance”. He believed that at this time the nation was wrong to take up arms and he could not imagine a war in which it would be legitimate to take part. His application was refused. Another applicant who objected on similar grounds was passed for non-combatant service after stating he was willing to work in the Army Service Corps but not to swear an oath. Monday 13th March 1916: The first Ampthill Rural Tribunal sat today and heard fifty applications for exemption from military service. Six of these were from conscientious objectors. The others came from a variety of occupations, although being a rural area the majority related to farm employees. A doctor applied for his chauffeur, stating he was absolutely necessary if he was to continue his practice as Medical Officer of Health for 31 parishes. He himself was unable to drive due to his eyesight and the lighting restrictions. Despite advertising in several papers he could not find a replacement. Again, a temporary exemption was granted until June 13th. A railway labourer applied to be exempted on the ground of domestic hardship as he supported his widowed mother. He was refused as there was insufficient evidence of hardship. A grocer and tax-collector applied for both his son and a labourer. The son managed the business and helped with the collecting. He had two other married sons, one working on munitions and one in the Post Office, a daughter who was not capable of working, and his wife was an invalid. The labourer was his only employee and could not be substituted; he delivered goods and worked on 4 acres of land. This man at attested but had been passed for home service only. Although the father stated he would have to give up the business without his son’s help the application on the son’s behalf was refused, but the labourer was conditionally exempted while in his current employment. A farmer of 310 acres applied on behalf of one of his seven sons, who was his horsekeeper and engineer. Two of the other sons had attested but none were actually serviing; an appeal to a higher court for another son had already been refused. The farmer was asked if he was not ashamed to appeal for this young man when he had all those other sons, but said he was not as he could not manage without him. The application was refused. A shepherd on a 436 acre farm was needed because the farm had 105 in-lamb ewes and he also helped with milking, building and thatching ricks. Other men had already left the farm to join the army. The shepherd was granted a conditional exemption. 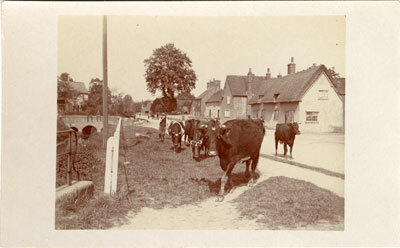 Sunday 12th March 1916: The village of Stotfold has responded admirably to an appeal to provide oranges for the Royal Navy, sending a grand total of 3,078 to the Fleet. 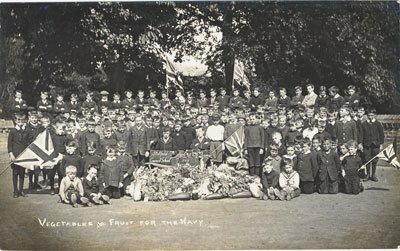 The boys of the Council Schools gave nearly 500 oranges, while the girls and infants of the Day Schools gave five shillings and seven pence to the collection. The district as a whole has sent over 15,000 oranges. 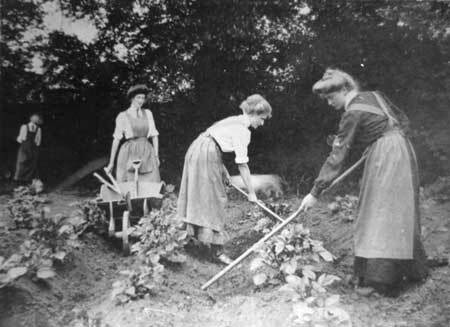 Saturday 11th March 1916: The work of women on farms, a frequent topic of conversation in recent times, was mentioned in a couple of cases heard at the Luton Rural Tribunal this week. A farmer in the Dunstable area appealed for his son who has been discharged from the Bedfordshire Yeomanry as a time-expired man after serving at Ypres and Loos. When he returned there was no other man on the farm except the father, who was being helped by one of his daughters. This young lady had driven a five-horse double plough all through the autumn, and was out ploughing with five horses again yesterday. The chairman of the tribunal commended her as a “plucky girl”. After hearing these circumstances the military representative changed his mind and withdrew his opposition to the appeal and the son was given a conditional exemption. Another farmer had a rather different attitude to women on farms. He applied for exemption for two employees. When asked if he could get women to do the work he said he had help from some of the village women in the hay season, but did not think women could stand farm work in the winter. He told the tribunal “If it comes to women working on the farm I shall clear out”. Asked if he was not fond of the ladies he replied, “I am fond of them to a certain extent, but not fond enough of them o put up with them as regards labour”. One of his worker also maintained his mother and was conditionally exempted while employed on the farm; the other application was refused.